A rooftop running track could be installed at a regional daily’s former headquarters as part of a redevelopment plan. An application has been submitted to Belfast City Council for the Royal Avenue site, which was home to the Belfast Telegraph until two years ago. Proposals for the existing building include an office development which could house 2,000 workers, while a new seven-floor building could also be constructed on the remainder of the site. 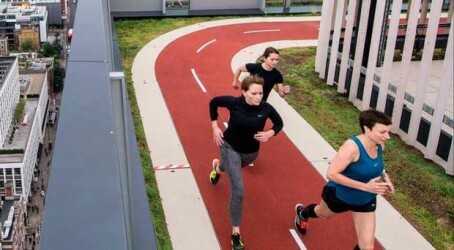 The development, renamed ‘The Sixth’ in a reference to the Bel Tel’s evening edition “the sixth late Tele”, could also host the city’s first rooftop running track. Work is due to begin by the end of the year if the plans get the go-ahead. Developers Bel Tel LLP, which includes directors from County Tyrone building firm McAleer and Rushe, said their plans “place user well-being at the centre of a pioneering office and creative workspace development”. Stephen Surphlis of Bel Tel LLP said: “Offices and workspace are evolving and UK and international companies are looking to Belfast and the wealth of talent we have on tap from our universities and within our professional, creative and technology sectors. “These firms are placing a premium on employee satisfaction and are seeking working environments that facilitate team interaction, innovation and creativity. The Bel Tel is now based at a new headquarters on the city’s Clarendon Dock, on the bank of the River Lagan.